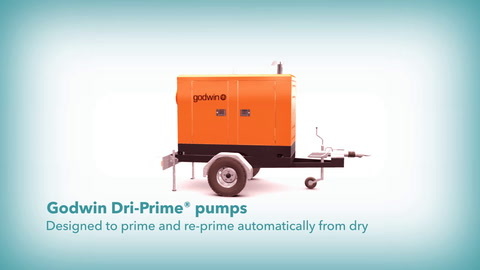 The Godwin Dri-Prime® DPC300 pump offers flow rates to 5,080 US GPM (​1,154 m³/hr) and has the capability of handling solids up to 3.7 in (95 mm) in diameter. The DPC300 is able to automatically prime to 28 ft (8.5 m) of suction lift. Automatic or manual starting/stopping available with mounted control panel or optional wireless remote access. Indefinite dry-running is possible with the exclusive Godwin liquid bath mechanical seal design. Solids handling, dry running and portability make the DPC300 the perfect choice for dewatering.